Gravis Marketing recently conducted polls in the states of Florida and Colorado. These battleground states are thought to play an all important role in predicting the chosen candidate in the upcoming 2012 Presidential Election. These polls seek non-partisan insight into the upcoming presidential election between Governor Mitt Romney and President Barack Obama. These influential states are being watched by citizens and important figures around the world. The present findings give the public a better understanding of where the likely voters in these swing states stand and show just how close this race continues to be. This data and the resulting conclusions will be used by pollsters and marketing in order to direct influential media input towards voters. Florida: The given poll showed that this sunny state is clearly divided in choosing the next president. A total of 617 likely voters were surveyed between October 13-14, 2012 following the Vice Presidential debates. Multiple questions were asked by both male and female voters. 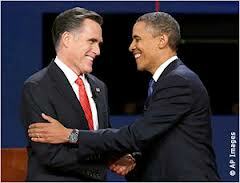 Results show that Governor Mitt Romney has a very narrow one point lead over President Obama. Of those polled 45 percent approved of the president’s job performance while 50 percent did not. The poll showed a gender gap between men and women and their choice for president. Women were more likely to vote for President Obama while the Governor held a large nine point lead among men. Romney continues to gain Independent voters support showing a lead of three points. These polls have a margin of error of +/- 4 percent. 29 electoral votes from Florida could be enough to swing a tightly contested ballot. Colorado: The poll surveyed a total of 2,089 likely voters between the dates of October 5 and October 11th2012 seeking insight as to who these individuals plan to vote for in the upcoming 2012 elections. This Northwest state poll showed President Obama maintaining a 2.4 percent lead over Governor Mitt Romney. While President Obama appears to still be ahead, these new results show a 2.1% decline from the polls given in September of 2012. The debates are thought to have had an impact in all of these new poll results. While many people surveyed in Colorado are sure of their pick there were still 5.6% likely voters who maintained they are undecided. This new information may play a huge role in the final results. These results carry a margin of error of 2.25. While carrying only 9 electoral votes, Colorado may be a swing state that causes uncertain voters in other states to take a particular stand. Colorado is a critical state for President Obama, if the President loses Florida, Virginia, North Carolina and Ohio, he can still win the election by the Colorado strategy, winning Colorado, Iowa, Nevada and New Hampshire. Here is a Map that shows the possible option. Many thanks to 270win for offering this.